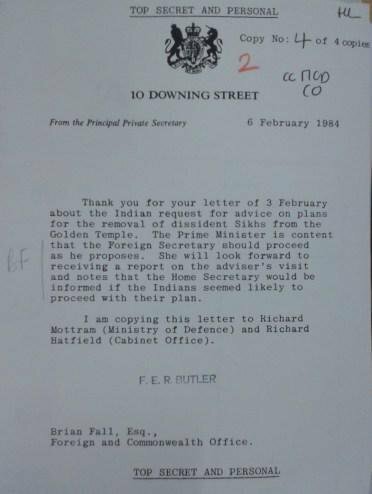 What to do about accidental disclosures that Thatcher's government advised India on Golden Temple raid? Hold an inquiry. Keep it tight. Sikh leaders in the UK have warned that an official review of British involvement in India's 1984 Golden Temple massacre is inadequate. 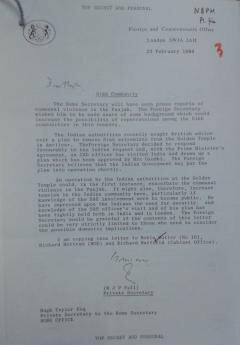 Prime Minister David Cameron ordered the review by Cabinet Secretary Sir Jeremy Heywood after I published letters from the National Archives (here), revealing that Prime Minister Margaret Thatcher had sent an SAS military officer to advise India on a plan to retake the Sikh religion's holiest site, in Amritsar. Indian troops raided the Golden Temple complex (Sri Harmandir Sahib) in June 1984 in a six-day assault codenamed Operation Blue Star. Sikhs claimed that thousands of people were killed. Indira Gandhi's government estimated the death toll at 400. Heywood, the UK's most senior civil servant, proposes to limit his investigation to events leading up to the raid. Sikh leaders told him his scope was “too narrow” and urged him also to review later military operations in the Punjab, specifically Operations Woodrose and Black Thunder, to check for any further British complicity in India's crackdown on Sikhs. Conservative Party strategists, who view the Sikh community as a key electoral constituency, may wish to note Sikh concern about the Coaltion government's commitment to transparency.